158 p., 15,5 x 23,0 cm. With contributions by Michael Hampe, Martin Hartmann, Andreas Hetzel, Jens Kertscher, Felicitas Krämer, Claus Langbehn, Helmut Pape, Marie-Luise Raters and Marc Rölli. Alfred North Whitehead declared the modern age in the first half of the 20th century to be the »age of John Dewey.« In his naturalistic metaphysics, aesthetics, theory of science, theory of the public, ethics, philosophy of religion and pedagogics, the intellectual, who was known to broad sections of the population, had an enormous influence not only on American thinking. In an era of specialized academic philosophy which finds it difficult to reach the public and hardly trusts itself to create comprehensive philosophical concepts, it is good to remember Dewey on his 150th birthday as a philosopher who, based on a broad concept of experience, covered the entire field of philosophy and as a political and ethical mind triggered many public debates. Current debates between naturalism and culturalism are marked not only by a dualism of methods dating back to the late 19th century but also by certain outdated metaphysical considerations. In his book Experience and Nature (1925) John Dewey suggested a plan how to deal with the antagonism between nature and culture. This paper reconstructs the main lines of Dewey’s argument by actualizing his distinction between primary and secondary experience and by investigating Dewey’s so-called instrumentalism. As a final step his continuity thesis is interpreted as a hypothesis that there is no radical discontinuity between nature and culture. In conclusion it is argued that the philosophical relevance of Dewey’s pragmatism was notoriously disregarded – in either naturalistic or culturalistic modalities. Dewey’s theory of situations completes the tradition of classical pragmatism. It provides us with an epistemological and anthropological account of human experience: The practice of knowledge in science and common sense both take their start from the constitution of habits in our practical experience of how actions and expectations fail and have to be corrected when confronted with refuting experiences. Dewey’s account of »the pattern of inquiry« takes this experience as its starting point and develops a natural realism: It understands interactive relations between the knower and its environment realistically by including immediate somatic, non-cognitive reactions and it integrates the conditions of success of common sense and scientific processes of practice. This article aims to present John Dewey’s theory of language as a contribution to a normative, social-pragmatist philosophy of language. It is argued that Dewey still deserves recognition as an early opponent of individualist or reductionist mentalistic theories of language and thought. Moreover, one can find arguments in Dewey’s writings against pragmatists who commit themselves to the Kantian tradition by relying on the ideal of the game of giving and asking for reasons. In Dewey’s naturalist account, however, such claims on rational foundations of linguistic practice can be avoided. For this purpose, I will examine Dewey’s naturalist method and its consequences for his account in the philosophy of language, as well as for his concept of the normativity of linguistic practice. John Dewey’s ›Art as Experience‹ (1934) claims a continuity between aesthetic and everyday experience. The article begins with a discussion of the reasons that motivated Dewey’s critique of classical autonomy aesthetics, going back to Baumgarten and Kant. Subsequently, Dewey’s naturalist and holistic theory of experience is interpreted in the light of his aesthetics. Aesthetic experience is explained as an intensified and therefore exceptionally accomplished kind of everyday experience, regarded neither as an experience of anything particular nor as the experience of a particular subject. Thus, Dewey became an important precursor of the ,performative turn‘ in aesthetics who also paved the way for fundamental insights in media aesthetics. The article closes with a discussion of the political implications of Dewey’s conception and relates it to the aesthetico-political project of avant-garde movements. This article traces the influences which American pragmatist philosophy and Dewey’s pragmatist aesthetics in particular received from the various idealist traditions of (a) the English romantic philosopher-poets, (b) Cambridge Hegelians in the vein of Josiah Royce, (c-f) three different generations of Oxford Hegelians, from Bosanquet to Collingwood, and, most directly relevant for Dewey’s philosophical development, (g) the late 19th century St. Louis Hegelians William Torrey Harris and George Silvester Morris. Another important influence for Dewey’s pragmatism, as well as already for Bosanquet, was Darwinian evolutionary thought with its emphasis on the needs for adaptation. Central points of interest in the development of Dewey’s aesthetics which he shared to some degree with the British and American idealists were the concept of aesthetic experience, the cognitive relevance of imaginative experiences and the practical relevance of fine art for developing shared forms of life. 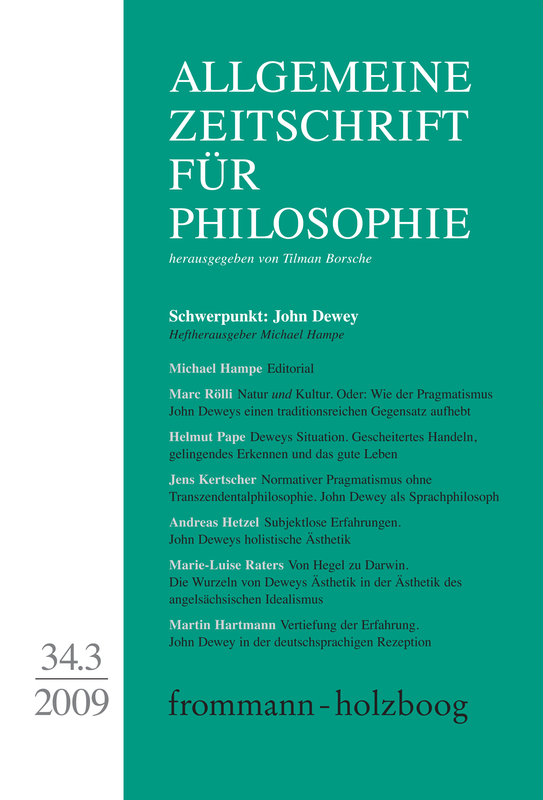 This article provides a survey of the main topics in the reception of Dewey’s philosophy and of American pragmatism among German philosophers. In the first half of the 20th century, German philosophers like Max Scheler, Max Horkheimer and Herbert Marcuse held a predominantly critical view of pragmatism which they dismissed as a shallow, uncritical version of utilitarian philosophy. After the second world war, philosophers like Karl Otto Apel, Jürgen Habermas and Hans Joas developed a more productive way of incorporating pragmatist ideas from Peirce, Mead and Dewey into their own critical philosophy. Whether the current Dewey renaissance among younger German philosophers might eventually lead to a profound reorientation of our understanding of philosophy in general remains to be seen. So far, Dewey’s ideas have become important mainly in aesthetics, focusing on the concept of aesthetic experience, and in political philosophy, with his suggestions for the development of an open, experimental culture of democracy. Claus Langbehn: Jim Garrison (ed. ), Reconstructing Democracy, Recontextualizing Dewey.